Reliance JioFiber home broadband services are expected to become commercially available around Diwali. Jio's broadband service is expected to become available in nine cities at the time of launch. Reliance Jio's next big launch is expected to be the commercial roll-out of its Fiber broadband service. A report in May suggested that JioFiber will launch around Diwali and will be priced at Rs 500 for 100GB data. Now a new leak reveals more details like availability and data offers. Reddit user nRomil has shared a screenshot of JioFiber's landing page, revealing the details of the location where the service will be available. The list of cities covered includes Ahmedabad, Delhi, Hyderabad, Jaipur, Kolkata, Mumbai, Surat, Vadodara and Vishakhapatnam. A tweet from JioCare had confirmed that the service will be available in six cities of Mumbai, Delhi-NCR, Ahmedabad, Jamnagar, Surat and Vadodara at the time of launch. Jio has already started beta testing the service in select cities as part of its preview plan. 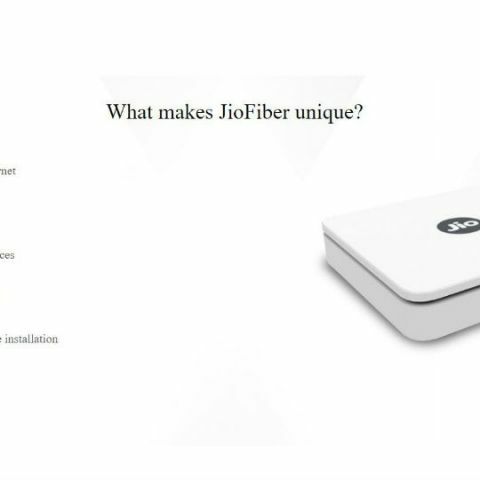 A Medianama report says JioFiber uses a custom router and may also have a mesh network of routers to expand coverage. Jio is reportedly charging a refundable security deposit of Rs 4,500 for installation. JioFiber users get 100GB data at 100Mbps for three months, similar to the VoLTE rollout. Reliance Jio's Fiber-to-home broadband service is expected to be the cheapest broadband service when it becomes commercially available later this year. Analysts believe the service will start at Rs 500 for 600GB data and come bundled with smart set-top box and Jio Media services. Even before its launch, broadband service providers like Bharti Airtel have started consolidating their offering. Airtel recently increased the data volume on its existing home broadband plan and introduced a limited period offer of 1000GB data bonus to its broadband users in NCR region. Reliance Jio has managed to rope in 120 million mobile subscribers since the commercial availability in September.